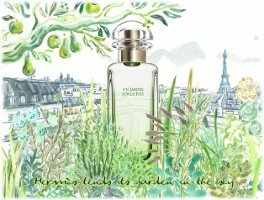 Un Jardin Sur Le Toit, the latest in the garden series from Hermès, spurns the exotic inspirations of its predecessors (Un Jardin en Méditerranée, Un Jardin Sur Le Nil and Un Jardin Après La Mousson); instead perfumer Jean-Claude Ellena celebrates the rooftop garden at the Hermès building at 24 Rue du Faubourg Saint-Honoré in Paris (although for some of us, a rooftop garden on the Rue du Faubourg Saint Honoré is hardly the stuff of everyday life). And what, pray tell, do we get from the Hermès rooftop garden? Apples and pears, apples and pears. Apples and pears, though hardly new to perfume, seem to be the notes du jour, and as I've already mentioned they're not exactly my favorites. Jardin Sur Le Toit starts out grapefruity-citrusy and sharp — for a second or two, it almost recalls Jardin Sur Le Nil — but it's only briefly so, then it's crisp apple and pear with plenty of green (the notes: apple, pear, rose, green grass, basil, magnolia and compost). It's bright and tart, and the green notes add a decent bite without being overwhelming. It's young and spring-like and fresh, and very Jean-Claude Ellena, which will either please you or it won't. The fruit gives way (partly) to the flowers: a gentle rosewater and magnolia blend that sort-of-vaguely recalls Kelly Calèche, although Sur Le Toit is more decidedly unisex. The base is a pale gentle musk, more vegetal than animalic, with just the slightest suggestion of warm soil. In keeping with the rest of the series, it's a transparent fragrance that lends itself to liberal application, and it's probably better suited to warm rather than cool weather. I found the lasting power to be just so-so, maybe not quite so good as my favorite (still) of the Jardin series, Jardin Sur Le Nil. Do I love it? I do not. I found it quite easy to wear, and there is something cheering about it; it made me smile to spray it on while the cold spring rain was tapping on my window. But it is, after all, still apples and pears, and it does not captivate me. Is it worth a try? But of course. You didn't think I'd say something by Jean-Claude Ellena wasn't even worth trying, did you? 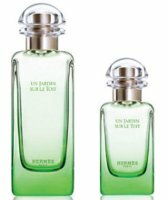 Hermès Un Jardin Sur Le Toit is available in 50 and 100 ml Eau de Toilette. I can do fruit, but it seems like it would hinge on the dirty drydown for me. Shame it doesn’t last. I wouldn’t call the dry down “dirty”…it’s more fresh/green than dirty. But it is warmer than the opening. JALM is really worth trying. It is the fragrance I reach for most on those extra hot and humid days. On me, it is all about ginger – so refreshing! Plus the sillage and longevity are excellent. I can’t wait to try this new one. I agree with Robin, a roof garden in Paris is plenty exotic! Breathesgelatin, for me you’ll have a nice idea of what is Un Jardin Après La Mousson when you try He Wood from Dsquared. I think they have a lot of similarities. I also think Un Jardin sur le Nil is my favorite, though I haven’t tried this. I adore Sur Le Nil…many summers, I wear the body lotion more than I wear anything else. I still haven’t tried any of his Garden Eaux. This sounds lovely as one of those post-shower or mid-day refreshers and probably won’t get in the way of anything else I may be wearing. Hmmm…they’re not really *that* light…they’ve got more body & complexity than classic Eau de Cologne, I’d say. Well then – It sounds like it would be lovely for the warm weather! Un Jardin Apres La Mousson is not at all light and ephemeral. It lasts a good eight hours on skin (on my skin anyway) and sings out loud and proud throughout. I’d hate to think what would result if I accidentally broke a bottle! Thanks for the review- Robin! I didn’t know there was a new Jardin coming out- so when I clicked in this morning and it popped up- I felt a little burst of joy! Certainly a must sniff- even if apples n pears. do you know-Is it exclusive to anywhere for a while? Hermes boutiques always get them first, but if a dept store has an exclusive after that, I don’t know about it. Now I can’t remember if Hermes generally does that? I didn’t think so. I will check Saks- one of these days. I do love Jean Claude (and his daughter). Keep correcting myself, but now I see that in my own review of Mousson, I mention that it’s exclusive to Hermes boutiques & Saks…. I’ve been checking the Hermes website and it hasn’t shown up yet. Sorry Robin. I should have read your comment before piping in. Your description (not the notes) sounds more like Pamplemousse Rose to me. I know it’s supposed to be grapefruit but I get that crisp apple smell from it, too! It will be interesting to try these at the same time. Oh, and if my other arm wasn’t already taken with a mess o’ scents, I’d try it! But going on memory, this is less grapefruit AND less rose. It’s really only grapefruity for a few quick seconds. But also think you’d recognize they were by the same person. I’m waiting impatiently to try this one. As Robin said, Ellena’s creations worth a try at least. I like pear smell, but not apple (it makes me gag). Does it smells too apple as Tommy Pour Homme (Tommy Hilfiger)? Tommy is much cleaner/”fresher”/aquatic, and smells much more mainstream, for lack of a better word — you recognize it instantly as a department store thing for men. This is gentler, more subtle, less overtly synthetic smelling. Thanks for the review, I was curious about this one – but I can’t stand pear in most fragrances so this is a definite no for me. It a shame really, I do love grapefruit – any suggestions on a candied grapefruit scent? -Pacifica Brazilian Mango Grapefruit – I had never sniffed this and actually like it quite a lot, even though I’m not a big grapefruit fan. Bonus – it’s super cheap! Also, PdE Yuzu Fou is a nice grapefruity scent as well. Great suggestions and thanks for doing the legwork – now all I have to do is order samples! And something else that I just can’t seem to make myself remember. I’ll comment again if it comes to me. Not sure about candied but there is a guerlain aqua allegoria called pampelune (I think). You are right, totally forgot about that one and Guerlain fragrances tend to work well for me – looking online now for a mini bottle. I loved the first two, and Mousson was not me, but not bad, so I’ll sniff this when I see it. You make it sound rather good, in spite of the apples and pears (two of my least favorite notes as well). It’s quite nicely done. I just don’t love it. If they’d done more with the compost, I’d have liked it better…it’s not earthy enough for me. It’s a pity it’s not earthy. That was exactly the aspect I was looking forward to. I find Mediterranee very earthy, if that’s any help. I didn’t care for it at first, but now I love it. I don’t remember Mediteranee right now, I will sniff it again. Thanks! I’m a fan of Hermès and and Ellena but the Jardins series never really grabbed me. I’ve yet to try Mousson and now I’m not desperate to sniff this either. Pear often smells harsh and acetone-like but I want to believe that Ellena can at least avoid that. But apple… apple that I can imagine being a problem since it instantly makes me think of shampoo. MJ Daisy, Chanel’s latest Chance flanker (Tendre? ), Clarins Eau des Jardins, they all have that apple shampoo vibe which just does nothing for me. Interesting, I think it is pear that makes me think of shampoo. But this isn’t very shampoo / body product – like. That’s re-assuring to know, I’m sure I’ll give it a sniff next time I’m pass by the Hermès counter, I just won’t be going out of my way to try it. After all, Ellena is one of the few perfumers who appear capable of doing grapefruit without the Tramp’s Armpit accord. Grapefruit is the most challenging note for me so anyone who can consistently make it palatable should be able to cope with apple, right? It is not so much grapefruit. And will not argue with you, but hey, he *can* do armpit! I submit Cartier Declaration as proof. It is genius, but it is armpit. This is my quote o’ the day: “It is genius, but it is armpit.” Soooo arty. LOL…yeah, it’s ridiculous, isn’t it? But true. I can’t help it. Lol, thanks for the heads up! I don’t think I’ve ever tried it and now I’m torn between wanting to avoid it at all cost on account of it being armpit and wanting to try it due to its genius. Is it grapefruit armpit? It’s the grapefruit which I find particularly offensive, probably because it’s so sharp. I’m not so bad with cumin and other such funk, for example. It is grapefruit + coriander armpit. And I seriously do think it’s a great scent. A classic, and deservedly. Thanks, Robin. I’m intrigued so I’ll probably give it a sniff but I’m only spraying a paper blotter. Heh A…you’re not casting nasturtiums at Pamplelune by any chance hmmm??? I really want to try it because it’s Ellena, but it doesn’t sound like my thing … and yet, it’s Ellena! I’m sure I’ll try it eventually. Thanks for the review, Robin! Exactly. You’ll try it eventually. Maybe you’ll love it, who knows? So far none of the Jardins series has worked for me, but I have high hopes for this one. I love the floral aspect of Kelly Caleche, so I’m glad you mentioned the similarity there. The only thing I’ve smelled apple in recently was Traversee du Bosphore, which I loved, so I’m feeling positive about that note—even if the perfumers styles are vastly different! Pear I don’t know about, but I guess I’ll soon see! I love Traversee du Bosphore! The apple here is much more front & center than it was in that one. Wait for the Kelly Caleche, it takes awhile to get there. Wow! It must project a bushel of apples then. TdB is full-on apple to me. Dee, if you like apple in perfume, do try Perfume de Rosine: Rose D’Ete, very nice summery rose and apple. can’t wait to wear it again! I’m looking forward to trying this, as Traversee and La Belle Helene have gotten me to like both apple and pear. And I always love the bottles in this series. I love the ombre color. I love the bottles too. But if, as I hear, he is done doing Jardin scents, hope he will do another pillar scent for women…he’s really only done 1 so far. Robin, your remarks make me want to try sur le Nil. I am very fond of apres la Mousson and FM l’Eau d’Hiver and agree anything in M. Ellena’s oeuvre is worth sampling! Oh, do try Nil. Obviously not everyone loves it, but I would bet it’s still the best seller of this series. Lil, Sur le Nil was the fragrance that turned me into a perfumista. One sniff of my mother’s bottle and I had to have it … and the rest is history. It’s a wonderful and unique scent. I also love Apres la Mousson, as one of the few scents that really refreshes me when it’s very hot and humid, so I can’t wait to try this. Thanks for the review, Robin! I’d be very surprised if they let the hoi polloi go up there…but who knows. I’ve still only tried Sur le Nil, and while I liked it, it wound up being too dry for me. Not masculine, but not very floral, and I kept wishing I’d put something else on. Traded my small bottle away, and I think its new owner appreciates it more than I do. I know you’re not a Petite Cherie fan, Robin, but that’s what I thought of when I first saw the list of notes for JslToit: PC, but more grassy/herbal/earthy. Is that fair to say, or is the emphasis different in this? More vegetal, for sure. I think of PC as feminine and “charming”, you know? (and it isn’t something I wear regularly, but I do like it, and I tend to forget the pear even though it’s quite prominent) This is not charming. And always think of PC as the perfect starter fragrance for a girl (although obviously anyone can wear it), this is not that at all. Gosh, was that even slightly helpful? I liked this very much when I tried it, but it’s not the sort of thing that keeps your interest for very long. Nice and springy fresh – I particularly like the basil note – but agreed on it needing more compost and base notes, something earthy or loamy. For something in the just plain pretty genre, I much prefer Rose Ikebana (which is, of course, much more expensive.) Kind of odd, but I think the best, most ambitious of the Jardin series is the one I’d probably be least likely to buy or wear, Mousson. I hated it at first – melon! – but after multiple sniffs, I agree completely about your “Diet Therese” assessment. I’m just more of a full-fat girl: both in Parfum de Therese and in most edibles. I love Rose Ikebana. And it is more expensive, but I think of it as more obtainable: I get get a 15 ml for not too much cash, whereas the Jardins, while cheaper per ml, come in much larger sizes. I wouldn’t argue about Mousson being the most ambitious. It never did really grow on me though. It’s been ages since I wore it, I should drag it out of the back of the cabinet & try it again. I think of Rose Ikebana as the epitome of the office scent. I like it very much for that purpose. Love Sur le Nil, and even got my friend wearing it, cuz I’m just that generous! Love Hiris, Amazone, Kelly, Osmanthe, and don’t even get me goin’ on Eau d’Hermes (my favorite dirty little secret). It’s a given I’m at least going to try this and in all probability love it! Thank God I don’t care for the Birken or I’d be in BIG trouble! LOL…yes, it is a good thing I don’t care about bags & scarves! Dear Robin, thank you for the review. I must confess that I eagerly await your reviews of this kind of fragrance (anything by Ellena-Hermes, Dior, Chanel, Guerlain.. you get my drift.) I feel I am getting a fair review and also a fun one. Now, how does this one compare to Jo Malone’s English Pears? I understand that this is perhaps comparing apples to oranges (no pun intended) but I am curious as it was a frag that I liked with pears, and that is rare in me. P, I wrote you a whole long response, hours ago, and am surprised to see it is not here. Who knows what fool thing I did. On the JM: the JM is darker & warmer, less summery, way less green. And was surprised to see the word “posh” — interesting how differently we see the Hermes line! I think of the fragrance line as “classy”…and this one is no exception, but they don’t smell overtly expensive to me at all. When I think of something that smells like a vat of money, I think of something like 28 La Pausa, or (had some other example earlier, and forgot it, drat!) Whatever it is, this one has the same aura as the rest, I think! But when you smell it, you tell me. also, perhaps my interpretation of posh is leaning more to classy than what it really means. For me posh means luxurious in a borderline noveau riche kind of way… Hermes is NOT like that to me, in the sense that it does not project “noveau riche” .. but luxury is luxury and the lines get blurry. As to “La Pausa” and the smell of the Chanels, well it does not smell of Money alone to me, but of A VERY VERY REFINED SENSE OF STYLE. I must confess that I am a sucker for the Chanel aesthetic, the image of Coco arriving with a tan in 1930’s Paris, wearing perhaps a variation of her jacket-skirt combo (I picture it white, with a matching white hat. Black belt and a black satin ribbon on the hat too) you see.. I am making my own picture-idealization of pre-war europe… I know it is probably better in my head than it ever was in reality, but that is what dreams are for, no? Yes, I’d say we use posh in the same way. I bet JCE uses expensive materials. But to me, they do not smell expensive. 28 La Pausa smells expensive. But not in a showy way, so perhaps posh is not right there either. Needless to say, I’m eager to try this. Sur le Nil is also my favorite, followed by Mousson (which I think is just great in warm weather). And I agree that for such “light” scents, the longevity is actually pretty surprising and tenacious. I don’t really have a problem with apple or pear. One thing about the grapefruit opening: I’ll be curious to compare to the opening of Iris Ukiyoé, which I found to be one of the nicest, “zingiest” grapefruit openings that I’ve experienced in awhile. Perfect, Iris Ookie works for me! I adore Sur le Med with its smoky underpinnings, so I doubt this one will do it for me. Still and all, even though I’d not wear Mousson, I’m glad to have sniffed it. Perhaps I’ll feel the same about this new one, too. I bought this a few days ago and have been wearing it ever since. It’s really nice when sprayed heavily. I find that it goes through more changes as it develops than Nil or Mediteranee. The tops notes are more fruity and makes me think of YSL In Love Again (which was an early Jean Claude Ellena frag), then it goes through a phase where it reminds me of Nil, and it has moments where it reminds me of a tuned-down Pamplemouse Rose or Kelly Caleche. It has just the touch of dirtiness that I experienced in PR (but just a touch, where PR does smell like dirty armpit in a pretty way). The lasting power is not as good as Nil (which was my favorite thus far in the series) but I find it to have more rose and the magnolia accord is very pretty. I think it’s more feminine than Nil and also more cheerful. It has moments where the apple/pear goes away and I smell more magnolia. I like it the best of the series. Thanks for the mini review! Really helpful. Reckon I’ll go for a sample of Toit ASAP. Oh good, really glad to see a fan! I’ll give any Ellena perfume a try. I like him a lot. I was bummed when Luca Turin trashed Jardins Sur le Nil, because like you and many others, it’s my favorite in that series. Also, it’s hard not to root for it being fabulous after reading Chandler Burr’s narrative about the process of making it. But I did agree w/ Turin’s assessment of that process — it sounded crazy/silly to me, and not at all the way a perfumer would presumably prefer to go looking for inspiration! Jean Claude and I have reached an impasse. Loved Sur Le Nil, but after half a bottle, it began to smell of cantaloupes–which I amp and hate. And then Mousson–ahhhhhnooooooo, melon again! Voyager is lovely, and when I tried it, I thought, “Whew, no melon. Glad I avoided apple, which seems to be the latest.” And now? Apple. Sigh. Just not for me. Well at least there was Voyager, right? I don’t mind that I don’t like every single thing he does — I couldn’t afford it! I’m looking forward to sampling this fragrance. I love Annick Goutal’s Petite Cherie and have been on the look out for a slightly more masculine pear fragrance (if such a thing exists…). Jean Claude Ellena to my rescue? OMG I think I could love this one…! I admit apple and pear are none of my business, but I also admit this is very nicely done and I enjoy the scent! At least there is none of a plastic, mainstream pear and apple – even Chanel did the pear rather departmentstore like. Have it, enjoy it, and appreciate it – I makes me smile. As a card-carrying fruit-hater, I was really curious to see what JCE could do. Honestly, I quite enjoy it (first application) but it smells like a greener Rose Ikebana, with the light honey scent, a tart green, and floral chorus. I’m not sure I need a bottle but I would wear it. Made a planned trip to the Hermes in Luxembourg to have a whiff of this… and I ended up leaving with a little orange bag, 50 mls packaged within. Back to Sur Le Toit – perhaps the most complex of the Jardins to my nose, this scent evenly walks the line of light and strong, masculine and feminine. The opening is biting and crisp, even slightly moist, with green apple – I can smell pears, but sort of honeyed and quiet behind the apple. To me, as the scent ages, the apple blends with the smell of watery roses and budding magnolias; as it reaches the final dry down, there is a musk, pale and clean, that reminds me of dried apple rinds and alkaline potting soil. I agree that in several stages and note arrangements, it recalls a lot of Ellena’s previous works with Hermes – Sur Le Nil, Kelley Caleche, Pamplemousse Rose… but it is fleeting. But I kind of like that actually.Not only does it serve as an airborn “calling card” for Ellena, but it is Ellena’s way of bringing the Hermes Jardin serious home – nodding to other scents in the Hermes collections, playing on the creative “home” and birthplace of Hermes and its garden in Paris. That idea kind of pushes Sur Le Toit ahead of my other favorite in the Jardin range, Sur Le Nil, because it evokes more of the legacy and bredth of why the Jardin concept is something Hermes works so hard on. It would have been interesting if Ellena should have started the range with Sur Le Toit, and then started globe-trotting to other gardens around the world – it would have allowed for a more encompassing and consuming experience with each subsequent release. But, that would have made the range a lot more “commercial” as flankers from the range sprouted from a “company oriented” branding, and not from Ellena’s creativity or passion for certain places. So if this is Ellena’s (and without Ellena, Hermes as well) last Jardin, bringing it home to the rooftop garden of Paris is kind of special. I agree! It might be the end of the Jardins line – and for that Paris sur le toit was the best point to end. I enjoy the scent very much still! On paper: I smell the citrusy opening and something that reminds me of papyrus plant sap… you see I am using a Papyrus shampoo from Klorane that smells exactly the same.. Green sap and distinctly papyrus-y. As it is to be expected, the green citrusy notes last longer on paper.. and then we go into the middle notes, with the pear and apple doing a dance of hide and seek. On skin: I get the same opening as on paper, but it lasts only 15 minutes, then it goes into the middle with (at least on MY skin) the notes of bulgarian rose and a hint of magnolia.. this gives way to the kelly-caleche phase that truly lasts 5 to 10 minutes at most. I’ll describe it as: this is the smell of my aunt´s leather bag wenever she carried her purse-sized spray of original caleche on it.. leather and caleche… and a little of pear and apple, but not much. Then towards the end it goes around the ROSE ROSE ROSE and sometimes the briefest HINT of compost, but it is just that.. if you smell it again its gone…to reappear briefly later. It becomes drier towards the end.. but I will see how much this lasts. Bottom line: I feel that of alll the series, this is the one that is most subdued regarding INTENSITY, but certainly the one that LASTS the most. It is (at the moment and having just sprayed it an hour ago) the least favourite for me from the whole series. I like it but I don´t think I would buy a bottle unless I find it at 30 bucks a bottle. 2) Mousson — on 2nd place ONLY because it is the only melon-cantaloupe frag that does not turn into soggy cardboard on my skin after 20 mins. 3) Mediterrane — nice, but it reminds me of Life Essence by Fendi too much. Hey, that shampoo sounds nice! Sounds like you get more rose than I do, but we basically agree — it is not their best. That price, yes, is steep! Not sure I’d pay that for any of them, although I use Sur Le Nil so much I suppose I’d probably cave. Yes, the shampoo is nice, if you can find it, try it! the do have a small 100ml size on the shampoo (i’ve seen it here in some stores) so it is a nice try-me size. And the smell is divine. If you let it act for a couple of minutes it really softens the hair. Ouch, is that for the 50 ml? sorry, my comment was meant to be a reply. The 50ml was something like R770, which works out to $115 given the current exchange rate! Anyway, I now have 4 precious vials of liquid light happiness. Ill-begotten gains can be so sweet! Having read some of the other comments on this blog regarding how expensive Hermes’s scents are, I just wanted to write that when I recently tried JSleT at a department store, the SA mentioned that he loves JSleT so much that he has gone through two bottles really quickly having used the juice to freshen his bed sheets. I had no idea that being a SA at a perfume counter was so lucrative! The look I must have given him makes me chuckle. Tried this today and WOW what a BLAST of apple and pear indeed. Unfortunately, for me, it wasn’t a transparent fragrance at all – all I could smell was just waves and waves of fruit emanating from my hand. I am a fan of Ellena but am very disappointed with the jardin series.Un Jardin Sur Le Toit,the fruit is more of passionfruit then apple or pear. Really like this – got Sur le Nil, too. Both very different, but both are “feel-good” fragrances, (as opposed to something “bleak” like Dune, which I love, too). I always apply fragrance to suit my mood, rather than the season.